As mentioned in the previous post, touring bikes differ from other bikes in certain very important ways. We’re going to delve into those ways a little deeper in this post thanks to my LBS owner June who helped me write this post. He’s owned his shop for 15 years and is a well-toured rider himself. When you’re gearing up for a tour, something long enough to require carrying a load, you’ve got to consider these important things when choosing your bike. Frame material- I only ride steel-framed (you’ll see cromoly often on spec sheets) bikes and recommend them to all my customers who are going touring. There is a lot of talk of the reasons people choose steel-framed bikes for touring. Most people you talk to recommend a steel frame because it is easy to repair cracks on the road, even in developing countries, and it is strong. Sounds good to me. 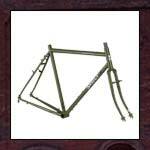 I have repaired many a steel frame but can be honest in saying I do not have the equiptment to repair aluminum or and composite frames. I’m sure the same goes for some repair shop in the middle of Turkmenistan. Chainstay length- So, the next thing you can look for in a good touring bike is foot clearance. You’ll probably be hauling panniers (bags on racks) and don’t want to be kicking and hitting them with your feet everytime you pedal. In order to gain clearance, you want a long chainstay measurement. Chainstay length is the distance from the middle of your rear dropout where the axle sits to the middle of the bottom bracket spindle. You should be looking at something in the 18″ (~460mm) range to ensure good foot clearance from your panniers. I’ll be back to post the specs from my popular touring bikes in another post. 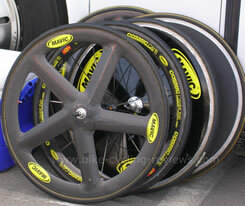 Rims- If you’re hauling heavy loads (including yourself), you’ve got to have sturdy rims. 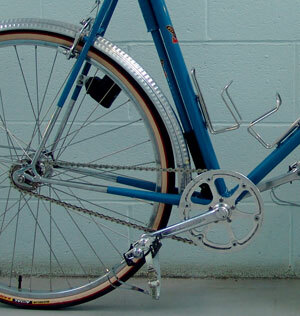 When you look at a touring bike, check out it’s rims, spokes, and hubs. You should be riding with 36 spokes to extra strength. 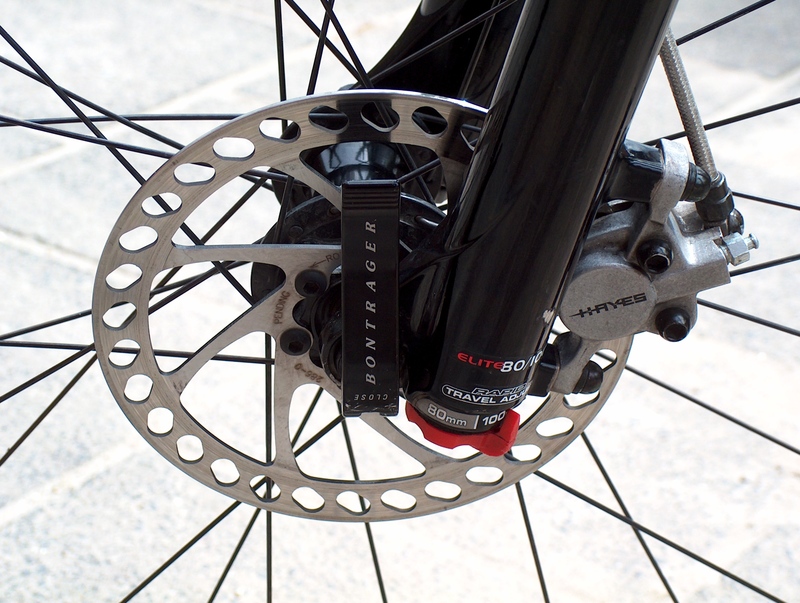 Brakes- You’ve got 2 pretty obvious options here, cantilever vs. disc. I would say that 95% of my customers ride their touring bikes with cantilever brakes (the ones that were on your bike as a kid with the pads), and only a handful ride with disc, and they are the ones on Raliegh sojourn bikes. The argument for disc brakes is their power. When you’re carrying a heavy load in the rain going down a dirt road in the mountains of Bolivia, you want your brakes to work, and disc will do the trick. Disc brakes are made of metal and are not prone to weather lubrication like the rubber in cantilever brakes, thus they are suitable for all weather conditions. They are connected to the bike hub and apply force to the hubs and spokes instead of the rims like cantilever brakes. Disc brakes will wear on your hubs/spokes, cantilevers wear on your rims. The placement and size of disc brakes will effect your load racks though, and that is why you don’t see these types of brakes on most touring bikes. There are specially designed racks out there for these brakes, but they are not the norm. But as far as repair and replacement go, cantilevers are the way to go. 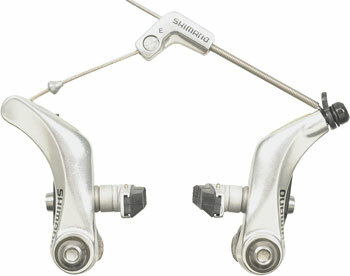 These brakes are cheap, light, repairable/replaceable, and powerful in dry situations. Most of us have used these brakes in the rain and know that dreaded feeling and sound when trying to stop on a dime. Other than that, they don’t effect your load racks, are easy to carry replacements, and readily available overseas. They get my vote.